The second main tank used by the Panzerwaffe at this time was the Pz.Kpfw. IV. Already by the beginning of June 1943 – when there were 932 Pz. Kpfw. IIIs and 1 ,047 Pz. Kpfw. IVs available – this tank was being used in the Panzerwaffe units in greater numbers than the Pz. Kpfw. III . In this photo we see a platoon of Pz. Kpfw. IV Ausf. 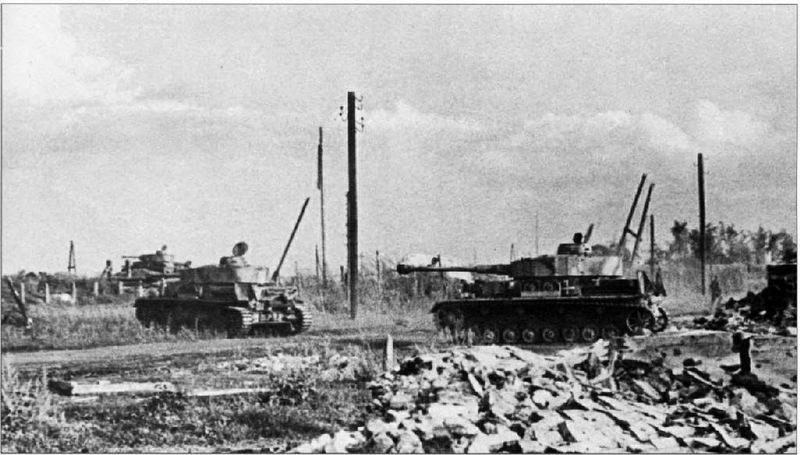 H with three-tone camouflage passing by the ruins of a town in the Kursk area. The Pz.Kpfw. IV was better in combat than the Soviet T-34, and the quality of German steel was better than Soviet’s. The best medium tank of the second part of WWI I – the Pz. Kpfw. V Panther – suffered from some technical problems in the middle of 1943. Nevertheless, it was a very dangerous weapon to the Soviet tank crews, who appreciated the tank very much. Here a soldier poses with a Pz.Kpfw. V Ausf. D belonging to the staff of an Abteilung. The tank is marked with the two-color (red outlined with white) tactical marking “A13”. Note the camouflage of the tank; it is covered with solid coat of brown and green spots, so the dark yellow color is only occasionally visible. The Ausf. D had no machine gun in the glacis plate, this being the standard for the tanks and self-propelled guns of the Panzerwaffe during this period of the war. 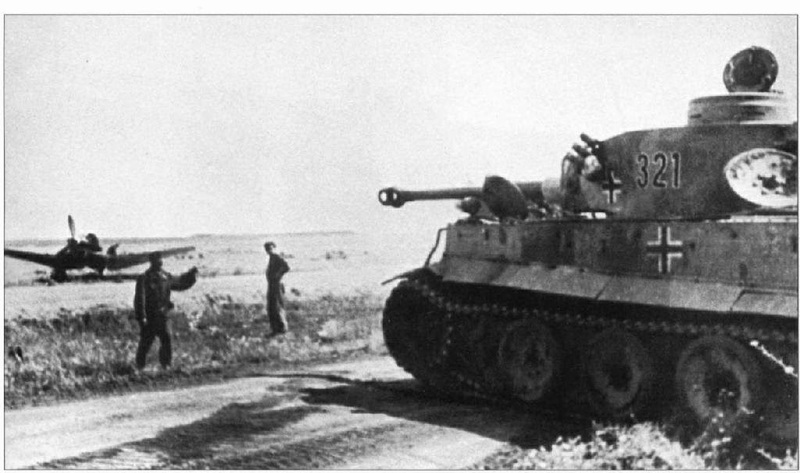 Tank units used Tigers during the fighting on the Kursk bulge – two battalions and four companies with 146 Pz. Kpfw. Vis. They lost 33 tanks, but destroyed about 30 times more Soviet tanks, many other weapons, as well as field installations. They lead almost every assault and gave immediate destructive support for attacking infantry. This photo shows one of these Tigers, which carries the tactical number “321 ” and is painted in a two-color camouflage scheme. One vehicle with more than its fair share of teething problems was the new Panzer Mk V, better known as the Panther. With the emergence of the Russian T-34 in the autumn of 1941 the Germans quickly realised that they would have to come up with an effective antidote. The plans for a heavier tank were revisited and work began in earnest. The resultant design produced a 45-ton tank, which was still classed as a `medium’ tank by the Germans. The Panther had the same sloping armour, wide tracks and a similar 75mm gun. Developed with breakneck speed, and rushed into production, the Panther made its debut at the Battle of Kursk, before it was really proven. Engine and transmission problems abounded. Engine fires were commonplace, dozens broke down and some vehicles went into their first action pouring fire from the exhaust pipes. Not surprisingly, the Panther was a disappointment at Kursk, but once it had overcome its initial teething problems, it would prove itself the best `medium’ of the war. The Panther was a far better vehicle than the T-34 but it was never to be available in the quantities which the war in the East demanded. Although 6,000 would be built, that was never enough, as the numbers destroyed always kept pace with supply. The advent of the Panther and the Tiger represented almost the end of the evolutionary trail in the Second World War. German tank sizes had steadily increased, from the 6-ton Panzer I to the 22-ton Panzer III and now onto the 62-ton Tiger. It would reach a peak with the 70-ton Tiger B, or King Tiger. The weight and superior armour certainly made the difference, but the quality had been achieved at the expense of quantity and it was quantity which Germany needed. The Tiger first saw action near Leningrad in August 1942. The results were poor due to inadequate infantry protection and poor deployment. The Russians were able to knock the tanks out by aiming at the tracks. The Germans quickly learned their lesson and future use of the Tiger I was carefully managed. The first large employment of the tank was at Kursk, when approximately one hundred were used. Almost half of these were issued to the elite formations of the Waffen-SS and the Grossdeutchland Division. The Tiger I quickly earned a fearsome reputation among its enemies. This tank only saw action for two years, but its reputation still endures today. 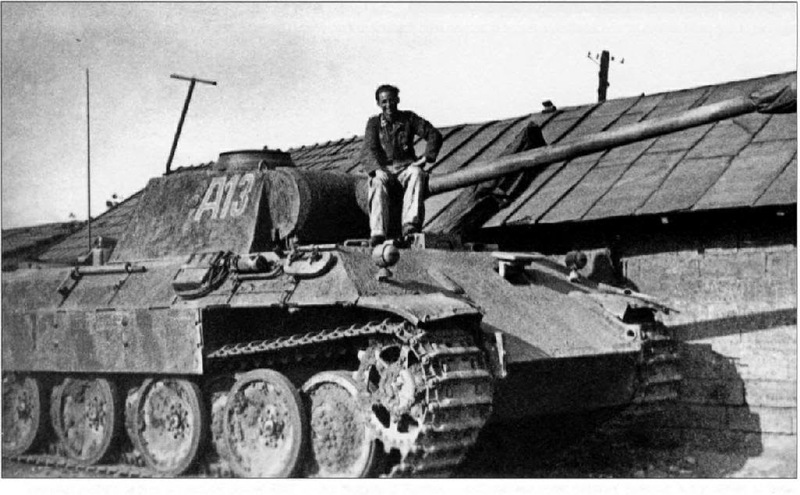 Unlike the Panther, the Tiger was designed on familiar German lines, but all the dimensions were increased. The main armament was the 8.8cm Kw. K 36, which was essentially the 8.8cm Flak 36 adapted for turret mounting. The mounting of such a heavy gun raised considerable problems of rigidity, and consequently the hull was constructed of large plates entirely welded together. The superstructure was made up in one unit, and welded to the hull. The turret wall was made from a single large piece of armour, 82mm thick, bent into a horseshoe shape. To give further protection all the armour plates were interlocked, in addition to being welded. The armour of the Tiger, at the time of its appearance, was the thickest ever to be fitted on any German tank; the front vertical plate was 102mm thick and the hull sides 62mm. The suspension, which employed interleaved, Christie-type bogie wheels with a very wide track, was reasonably simple and was an effective solution to the problems of such a large and heavy vehicle. The Tiger engine required very skilled driving and maintenance to get the best performance, and in the hands of insufficiently trained crews mechanical troubles were apt to appear. This characteristic was the tank’s principal disadvantage. The five-man crew was the standard for all German medium and heavy tanks. The crew of a Tiger consisted firstly of the commander, who was in charge of the vehicle and selected targets. He also fired the turret machine gun. Next came the gunner, who sat next to the commander and targeted his enemies through his gun sights. In many respects, he was the most vital member of the crew. In battle, every shot had to count. The flight of a shell is affected by many factors, including wind direction, rain, snow and other atmospheric conditions. The gunner had to gauge the range to the target, allow for any climatic factors and compensate for the speed of any moving targets, which were more difficult to hit. One miss could allow an enemy tank to get in the first vital shot, which spelt death in the tense tank duels of the Second World War. The main 88mm armament of the Tiger was aimed and fired as a result of a team effort. It was the job of all members of the Tiger crew to use their vision devices to identify potential targets and to report them to the commander. The Tiger commander would then prioritise the target and would give orders to engage it. The gunner would traverse the Tiger’s turret using a hydraulic system controlled by a foot pedal, aim the gun using a binocular telescope sight and then fire the gun using an electrical ignition system. The loader was responsible for selecting the correct type of ammunition from the ammunition bins, which were included in the Tiger’s structure, and using an automatic or semi-automatic loading system to load the gun. After each engagement he also had the laborious job of emptying the shell cases and restocking the tank with the cumbersome rounds for the main gun. Inside the hull, towards the front of the vehicle, sat the driver. On his right was the radio operator, who fulfilled the vital communications function, and also manned the hull machine gun. The usual practice was for the crew of a tank to paint a white ring around the gun barrel for every enemy tank destroyed. Some crews were so successful that a thick white ring had to be painted, representing ten kills. The most successful commanders proudly carried an array of kill rings like so many strutting peacocks.